You should be aware from recent BVRA communications and other sources that a number of plots of land in The Coombes have been put up for sale by auction and some have been sold. Diggers have now been sighted on these plots and Wokingham Borough Council (WBC) have been alerted. The note below is an email update from Jason Varley at WBC on 13 November. Over the past week there have been communications between Jason and some of the purchasers to advise them against carrying out any development work without planning permission. All of the trees in this area are protected by Tree Preservation Orders but not it appears, the rhododendrons and general undergrowth, which is part of the Designated Local Wildlife Site. A further update is that a local resident attended the auction which took place yesterday (for information only!) 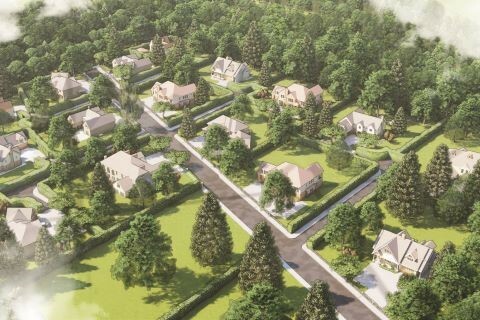 and confirmed the auctioneers are showing an "artists impression" of housing developments which could be built on these sites (see picture below). Barnard Marcus will cover themselves by saying this is subject to planning permission but this is clearly potentially creating an expectation for purchasers. Trading Standards have been advised again of this (we are still awaiting their conclusions) and Jason is also following up on this. If you are walking in The Coombes and notice any further activity please let both the BVRA and Jason know directly (with photos if possible). Thank you for your concerns about the Coombes woodland. I visited the site today with a colleague and observed the mini-digger at the top of the slope and a taped-off area which I believe is the proposed location of the access track shown on the sales particulars. No evidence of any damage to trees or construction work was observed and there was no one on site. On Friday we made contact with the owner of one of the plots who advised that they had hired the mini-digger to gain access to their land so that they may clear rhododendrons, removal of which does not require consent, from their land. Advised them not to use the digger and believe they stopped, although complaints received on Sat that works on site were continuing, not sure if this was by using the digger or by hand. Have been advised that some of this had occurred over the weekend. We will undertake Land Registry searches of all plots so that we may write to all registered owners to remind them of the TPO protecting the woodland and the requirements to get the correct permission in place prior to undertaking any works. Also advising that any unauthorised works to protected trees may lead to criminal proceedings. An injunction is not considered appropriate at the moment as there is not enough evidence to secure one at present, this option can be kept in mind should the balance be tipped in its favour through unauthorised works. We will continue to monitor the site and will go out again at least one more time this week. Obviously, please let us know should you observe any works to the protected trees so that we may investigate further in order to gather evidence.